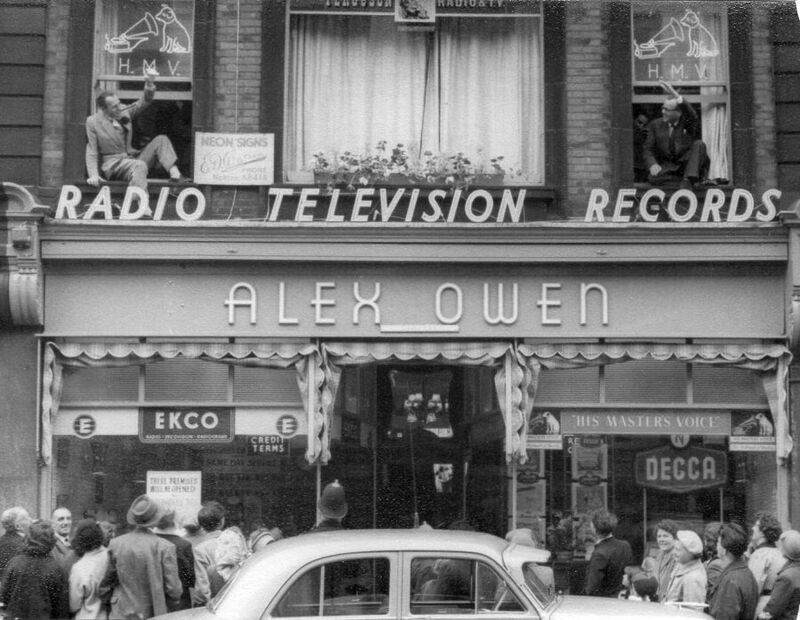 The rise and rise of the Alex Owen television retailing organisation was a phenomenon of the 1950s. Those of us who were around at the time remember it well. After first opening in Chilwell after the War, Alex Owen shops began to appear everywhere throughout the East Midlands during the 1950s, controlled from headquarters in Beeston. The shops were well-stocked, modern and inviting and soon became the place to go for the television set that, then, every family suddenly wanted - a phenomenon that continued as they diversified into home appliances, audio and records, all backed up by first-class, dependable service. Even as a teenager, David Hallam observed and admired the enterprise that must have been behind this seemingly ever-growing organisation - which, as we now find, began to decline after Alex Owen himself retired from the business in the mid-60s and the market consolidated around the nationally-known names. Finding that there was little that was remembered locally from those heady days, David set-out to find out more about Alex Owen. Over the last year, it has been a pleasure to work with his daughter - now Ros Whittaker - and his son Rob and to learn of the high personal esteem in which he was held by his family and others whose life he touched. Alex's own health during that time was such that he was not able to contribute to piecing together the story. Sadly he died on January 18th 2015, aged 94. Alexander (always known as Alex) Owen was born in Chester on 16 March 1920, the son of Charles Alexander Owen (1888-1976 1) and his wife Kitty (née Gregory, 1896-1967 2). After war was declared in 1939, like most men of his age, he was called for service in the forces, in Alex's case, in the Army with the Royal Welch Fusiliers. After basic training at Holywell, his aptitude for the subject led to his assignment to a course of training as a radio technician that was then based at Nottingham University. He came to believe that this was his big break in life as this gave him a skill to bring back to civilian life after the war. While stationed in Nottingham, early in the war, he met Marion Kelham (1923-2011 3), the daughter of Ernest Walton Kelham (c1888-1968 4) and his wife Margaret Rebecca (née Felstead, c1890-1955 5). Ernest had followed his father into the family butchers business which had moved from Beeston to Chilwell in the early 20th century. The family lived and traded from premises on High Road, Chilwell, nearly opposite Cator Lane, on the corner of Meadow Road, with livestock in a field to the rear, running down to the school on Meadow Lane. Alex and Marion became very close such that, when Alex was posted abroad in 1943 he resolved to return once the war was over. He was to carry her photograph and the couple continued to correspond throughout the rest of the war. It was the beginning of a close and deeply loving relationship which was to continue throughout their sixty-five years of married life. They were to became inseparable. 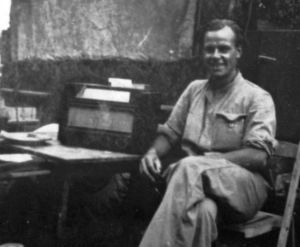 The war, however, was to continue for another two years during which Alex was involved with Montgomery's Eight Army, which fought across North Africa, and then, the invasion of Italy, carrying out his role of supporting vital radio communications for an army on the move (see left). During this time, he was to contract malaria and spent some time convalescing in Monopoli, Italy where he kept the cinema going for troop entertainment. With the war over, Alex and Marion were married on 21st September 1946 at Attenborough Church and were able to use a piece of land next to the Kelham shop to build a house (163 High Road, Chilwell) for themselves. This was to remain their home until they left the area following the sale of the business. Alex was now in a position to combine the skills he had acquired during the war with space that was available in the Kelham family home in Chilwell to form a shop in the High Road frontage, to get started in business, in 1948, as a ‘Radio & Electrical Engineer’ – crucially, this was perfectly timed to catch the beginning of the wider adoption of television. The BBC had originally started broadcasting television in the London area in 1936, from its transmitter at Alexander Palace but this ceased when the war started in 1939. It was started again in 1946 in London and, in December 1949, transmission were started to the Midlands from a new site at Sutton Coldfield, near Birmingham. Alex was in a position to take advantage of this opportunity immediately and began to put together a team, built relationships with manufacturers and quickly broadened his range of household appliances. 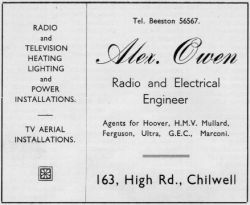 By 1952, as the advertisement 6 from that time (see right) shows that he had developed a well-rounded business, supplying television sets and household appliances and carrying out heating, lighting, power and TV aerial installations. Already, in these early days, he had acquired agencies for Hoover, HMV, Mullard, Ferguson, Ultra, GEC and Marconi. By the early 1950s, television was beginning to take off in a big way and the Chilwell shop was benefiting more and more from that demand. Storage space began to be stretched and stock - as family members recall - had begun to encroach, more and more, on living space in the associated house - but these were exciting times so perhaps such a minor inconvenience could be put aside! Pressure on space and staff would have been particularly acute as the Coronation approached in 1953 - this was a big milestone occasion for television, when many households bought their first TV to watch the big event. Many others were encouraged to do so, having experienced TV for the first time when watching the Coronation at a neighbour’s house - often on a tiny 9" screen. 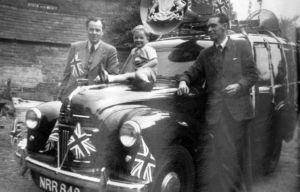 The photograph on the left shows Alex (left - with Rob, his son, happily sitting on the bonnet) standing by a vehicle decked for the Coronation and ready to advertise the shop. Just in time for the big day, Alex had opened a second shop at 132 High Road, Beeston and was therefore able to relieve some of the pressure on the Chilwell shop and to take full advantage of these boom years in both Chilwell and Beeston. Alex Owen Limited was incorporated in 1953, the more appropriate basis for the structured organisation that would be required to continue to grow the business. Norman THROP – who had a similar wartime radio background with the Merchant Navy. Eventually, in about 1949 and with help from Alex, he was to take over the Skegness shop. Don MARSHALL and Mr WALKER – who worked in the Alex Owen workshop and remembered by Rob Owen. They encouraged his practical skills, as a small boy, when he visited the workshop with his dad. E. Arthur SHAW – who joined to keep the books, became a Director in about 1956 and was eventually to take over the business from Alex. Ann (or Margaret) ENION (?) - who was Alex's secretary for several years. Doreen KELHAM - the widow of Marion's brother John. After working at the Chilwell shop, she operated the switchboard at the Beeston headquarters. Peter KELHAM - Marion's eldest brother, a retired policeman, worked for Alex in a security role. It may have been tempting to continue this expansion too quickly but this was resisted for the moment, with Alex concentrated on developing the business that he had started so well. Perhaps the next move was obvious - a shop in Nottingham - but it needed to be well planned and on a bigger scale than those he had opened so far. By 1955 he was ready and his shop at 51 Carrington Street, Nottingham was opened in that year by the then top comedy star, Terry Thomas, seen in the upstairs window on the left, greeting Alex in the right window. Click the image or here to see more. By all accounts, the opening day was a great occasion, enjoyed by all involved - so much so that Terry Thomas, who was appearing in 'Room for Two' at the Nottingham Empire Theatre, returned a few days later for a three-hour private visit. Alex could be well pleased that the occasion had been such a success and that he had now established a solid presence in Nottingham. As he reflected on this, he would have been aware that the appeal of television - already well established - was about to be given a further boost by the opening of commercial television, due to be available in the Midlands in the following year - and, despite the huge popular appeal of television, over two-thirds of UK households were yet to own or rent a set. Clearly encouraged, Alex began to consider further branch expansion and, perhaps as a first step, appointed E Arthur Shaw as a Director of the company. They were to oversee a remarkable expansion that saw the company growing to a network of 47 shops with 500 employees over the next nine years. Not surprisingly, given his own practical background in the industry, Alex always placed great emphasis on providing a first-class after-sales repair service. Nowadays we are used to television sets and similar equipment continuing, often for years. without the need for repair - but then things were very different. Transistors were not yet in domestic use 8 and, of course, integrated circuits were decades away. 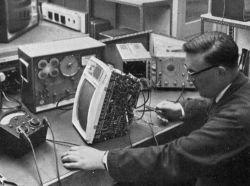 TV sets contained valves, a cathode ray tube and other vulnerable components that failed from time to time and users expected to have to pay to have them fixed - and, for a potential buyer, this was often a worry that would hold them back from purchasing. For that reason, Alex Owen advertising always placed great emphasis on the company's service standards, stressing its same-day service and free six-month guarantee, provided by its team of specialist engineers. 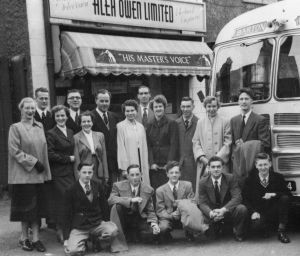 This same-day service was made possible by mobile engineers in a fleet of vans - 22 vehicles by 1958 and eventually growing to about 50 - that was directed by two-way radio - originally controlled from the company's first record shop at 1 City Road, Beeston. The Service Department was also responsible for some specialist services too - including the company's mobile public address and closed-circuit television facilities which provided useful service at public events all around the area. (Click the image on the right, or here, to see more). Over the years, Alex had tried very hard to obtain a dealership with Philips but, so far, Philips had continually turned down the proposal, citing existing local dealerships that they felt were operating well. But now, it seems, Philips was willing to change its mind after Alex had first demonstrated his exceptional after-sales service standards and now his clear ability to develop his business. Philips had begun producing television sets in the UK, at a new factory in Croydon in 1956 and were clearly interested in establishing strong dealership relationships. Philips appear to have seen the development and support of regional branch structures, operated by proven entrepreneurs - such as Alex Owen and similar companies in other regions - as the way to achieve this 7. Although we can only surmise, it is likely too that this relationship provided much of the financial means to fund the subsequent substantial growth in the Alex Owen organisation by financing the resulting very large inventory requirement. Perhaps remarkably, this arrangement did not restrict the dealer to Philips products only and, certainly in the case of Alex Owen, other relationships - such as with HMV, Decca and Ferguson as well as a range of white goods manufacturers - continued largely unchanged. In February 1958, when the Civic Restaurant building on Station Road, Beeston 9 came on the market, it was decided to purchase it and to turn it into the company headquarters to bring together the administration and service aspects of a growing business, soon to grow its branch structure dramatically. Particularly striking was the radio mast, erected prominently above the building, providing the two-way radio contact with the service van fleet. The building is remembered by many as a busy place, with offices and workshops able to carry out all aspects of television, audio and domestic appliance support - even a woodwork department, catering for those who wanted a custom-built cabinet. And, there was a printing department too, that produced most of the company's stationary. There are also memories of the Tannoy announcement when the London Carriers 10 truck had arrived, loaded with Philips televisions and everyone was required to get them safely into the building. Around this time, the van fleet was formalised within a Transport Division based, it appears, on Lilac Grove, Beeston. In 1964, the much of the fleet was replaced (Shown above left - Click the image or here to see more). The Lilac Grove site also housed a domestic washing machine workshop and, when colour televisions first appeared also had a small specialist office for their repair, before it later became merged into the mainstream service operation. The company's first shop outside the Nottingham area was opened at 138 Drummond Road, Skegness in about 1956 and was later taken over by Norman Throp in recognition of his early service to the company. 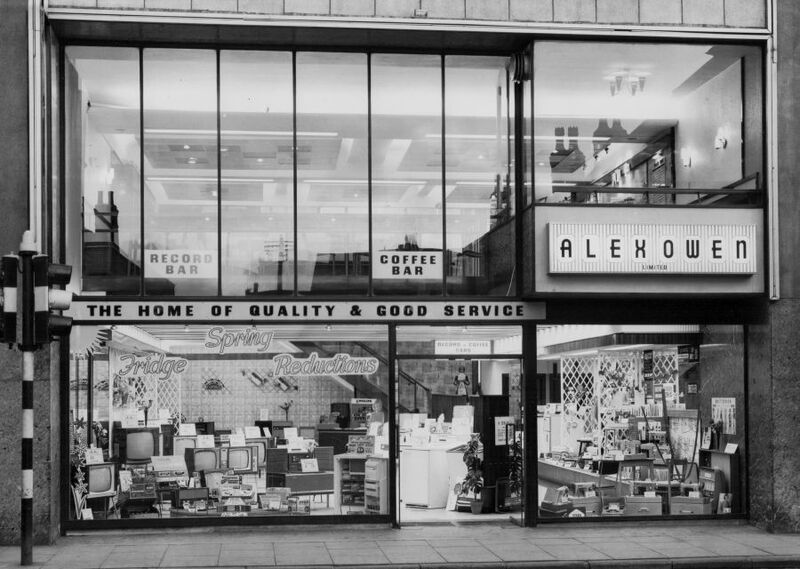 In Beeston, a shop had been opened by 1956, at 1 City Road, to cater for the growing demand for records. 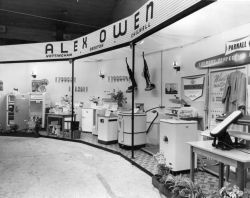 Now that the company's headquarters was in place, the next few years saw Alex Owen stores opened in communities all over the East Midlands - including Long Eaton (2 Tamworth Road), Stapleford (250 Derby Road), Derby (17 London Road), West Bridgford, Newark (22 Market Street), Loughborough (22 High Street) and Coalville (6a Jackson Street) - almost 25 new stores in total. Ever looking for the latest idea and trend, Alex, accompanied by his wife Marion, visited America in 1960 on a fact-finding visit. In 1962, the company made a giant leap into the West Midlands when 18 shops in the Birmingham area were acquired from Sam Carpenter & Sons. By this time, too, the company had diversified into domestic appliances generally and were frequent attenders at exhibitions that promoted this growing market - click the image on the right or here to see more. By 1958, the company had begun the reconditioning and sale of used washing machines and then recruited a plumber to install washing machines. By 1960, this side of the business, now known as Nuholme Plumbers, had begun to grow rapidly and it had opened the Domestic Centre at 192 Radford Road, Nottingham and, later in the decade, was able to take advantage of a temporary tenancy in the former Boots building in Beeston Square, pending its demolition and redevelopment. This side of the business was to diversify into general domestic plumbing and heating and, combined with another department which undertook electrical work, eventually formed a Contracts Division that carried out more major work for councils and building firms throughout the country. By 1963, with its headquarters in Beeston and a growing network of shops, it was time to improve the company's retail presence in Beeston. The existing shop, at 132 High Road, had been the company's second shop and had served it well but was now too small for the potential market in Beeston and was positioned outside of the main shopping focus of the town. Burtons had been Beeston's first grocery supermarket when it opened at 14-16 High Road in December 1957. Now that Burtons had moved out, Alex Owen was able to take over the site and open its showcase store (shown below) in the prime Beeston location, next to Victor Oade's menswear shop, facing the end of Wollaton Road. Click the image or here to see more of the features of this store, including the large selling area on the ground floor - a one-stop shop for all home entertainment and domestic appliance needs - and another floor upstairs for record sales and a coffee bar - where the 1960s scene had reached Beeston ! 1964 was to be a watershed year for both the company and for Alex Owen personally as it was in that year that Alex retired from Alex Owen Limited citing 'medical advice' as the reason. It was emphasised in the local press at the time that this was not a ‘take-over’ – just an internal agreement between Alex and Arthur Shaw, who now became Chairman and Managing Director, and that 'no outside organisation had any control or influence'. While health may indeed have been an important factor, there was probably other factors in play in Alex's decision to move on. The company that he had founded and led for 16 years, during which it grew from one shop to a network of 47 shops covering the whole of the Midlands. This had clearly been a very busy time, during which he had demonstrated his entrepreneurial ability and innovative thinking but the company had grown far beyond what he could personally supervise and influence on a day-to-day basis - a changed environment that probably did not suit his personality and interests. And too, the market was changing rapidly. 625-line screens were just beginning to be available and colour television was expected to appear on the market shortly. These were fundamental changes in technology which would have to be responded to and would require investment, training and a general refocus. With colour televisions costing about four times the cost of monochrome sets, this would probably mean a much greater dependence of funding from suppliers - probably, in the main, from Philips. For some years, Alex and his family had enjoyed a holiday retreat in Wales. Now, perhaps, with an attractive - though not now quantifiable - financial offer available to him, the possibility of retirement there, had become an attractive alternative to increasing challenges within the business. Sadly, within five years the Alex Owen identity and local control of its activities were to effectively vanish. Although the sequence and timing is unclear, it seems that, by the late 1960s - possibly in July 1967, when Philips secured £574k against Household Investments debt and took a further charge against all of Alex Owen Limited freehold and leasehold property - the company had become at least partly owned by Philips. By 1970, when the company was consolidated into Loyds Retailers - a subsidiary of Ada Halifax, owned by Philips - the acquisition was probably complete. During these transition years many of the Alex Owen shops - including Beeston - continued to trade, though their signage was changed to 'Loyds'. By 1969, the Station Road administration had been closed down, though some servicing continued to be based there, even after August 1971 when overall control of all Philips 'Coll-Ada' service operations was moved to Wolverhampton with E. Arthur Shaw as Group Service Director and Brian Bradley, previously the Service Manager at Beeston, leading the Central Service Team there. Soon after 1975, the Loyds retail outlets were closed and the repair operations were wound down - it was the decidedly unremarkable end of a story that, in its beginning and heyday, had been a remarkable local success story, driven by an exceptional man. It is a Beeston story that had been almost been forgotten and it is a privilege to have recorded it for posterity. We would welcome hearing from anyone who worked for Alex Owen or who can put us in touch with someone who did. A Very Active Retirement ! In September 1964, Alex's son Robert joined HMS Conway, the naval training school, then based on Anglesey. Soon afterwards, Alex bought a beautifully located house at Dwygyfylchi, near Penmaennawr, in North Wales and left Nottingham with his family as the first step in his retirement plans. But, aged only 44 and still full of ideas, he was not likely to spend much time sitting out his retirement ! He soon developed the idea of developing a holiday accommodation business in the North Wales area. During the years when the family had spend their leisure time at their holiday home in North Wales, Alex had developed a close friendship with Jack Davies, a local newsagent, who had considerable knowledge of the area as well as building expertise. Over the next two years, they spend a lot of time together, exploring the possibility of buying a caravan site. Eventually, in 1966, Alex selected and purchased the Caerffynnon Estate in Talsarnau, near Harlech which had previously been used by the Central Electricity Board to provide accommodation for senior technicians, during the construction of the nuclear power station at Trawsffynydd. As well as the main Hall, it had a number of well constructed chalets in the grounds, all with mains services, that could be developed. After the first year, when Alex and Marion ran it as a country hotel, Alex backed his judgment that self-catered holidays were the future and, again with his friend Jack's help, he set about converting the Hall into luxury flats, modernising the chalets to a high standard and converting outbuildings into cottages - with the novel idea of having the living space above the bedrooms to take advantage of the spectacular views. He introduced quality bar food, innovative in its range, well-presented and served informally but efficiently - qualities that were not then universally evident - making the venture particularly successful. Catering for weddings and functions added another level of success. These fashionable and very successful innovations were to confirm Alex's remarkable vision and tendency to be well ahead of the game - whatever he tackled. During these early days at Caerffynnon, Rob had completed his time at HMS Conway, had completed a Merchant Navy apprenticeship and was serving as an engineer in the navy. During long periods of leave, he was able to help Alex to maintain the high standards of the holiday accommodation. In 1972, he decided to leave the Navy and help his dad run the estate. Caerffynnon was sold in the mid-1980s but already, before that, Alex had contracted out the catering so that he was able to spend more time providing for his wife Marion's increasing care needs - a role that he carried out unfailingly until her death in August 2011. When Alex himself died in January 2015 he had lived almost fifty years of his life in the North Wales he loved, where he had gained many friends and where he was much respected. There might also have been time to reflect on a remarkably full, interesting and successful life - who could ask for more.